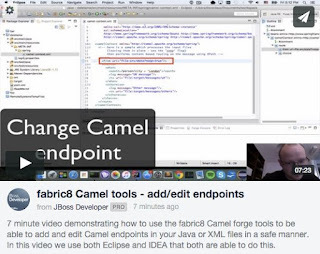 This is a continuation of the video blogs I have done about our development on the fabric8 Camel tools. Today is friday so it was a chance to grab a beer and do a one take video recording. This time demonstrating how the Camel tools is able to from the cursor position in your Java editor such as IDEA or Eclipse to add or edit Camel endpoints in a type-safe way using a wizard. What is cool about the command is that you just put the cursor on the line with the endpoint to edit, or place the cursor where you want to add the endpoint. The video is 7 minutes long and shows Eclipse and IDEA where I edit two different Camel projects. One project is using XML for declaring the Camel routes, and the other is using Java. The tools work with both kind. So sit back and grab a beer and watch, or if you are in the office then maybe grab a coffee or tea. We are working on doing the same for the EIP patterns and got that working for XML, but the Java bits is still pending. But down the road what you see in this video would be possible to across the board in Camel.